It's been 8 months since Sherlock left New Yoirk and much has changed. He has a new protege and Watson is trying to catch an elusive killer. Can they resume their partnership again? Watch Elementary online and find out. It's been eight months since Sherlock left Joan Watson via a terse note, but she's managed to build a successful P.I. business and continues to consult with the NYPD. Initially it appears she's having a friendly lunch with a girlfriend, but Elaina March is the head of a drug cartel. While Joan keeps her busy, the NYPD has captured her bookkeeper. On the way to testify against Marsh, the bookkeeper is killed in an elevator along with a police officer. But they cannot figure out how the killer got in and out of the elevator. March is released. Still on the hunt, Gregson gives Watson a message from a tipster. Watson recognizes the tipster is Sherlock. She goes to the brownstone and finds him. Watson tells Sherlock that she doesn't need him anymore. Sherlock goes to Captain Gregson to see if he can consult again with the NYPD, but Gregson says it's up to Joan. Meanwhile, Joan notices someone woman following her and assumes it's one of March's goons, buy it's Sherlock's new partner. Watson goes back to the murder scene and finds Sherlock investigating. He confesses why he left and asks for her permision to work with the NYPD again. Will Watson forgive Sherlock? Can they put aside their differences to solve this murder? 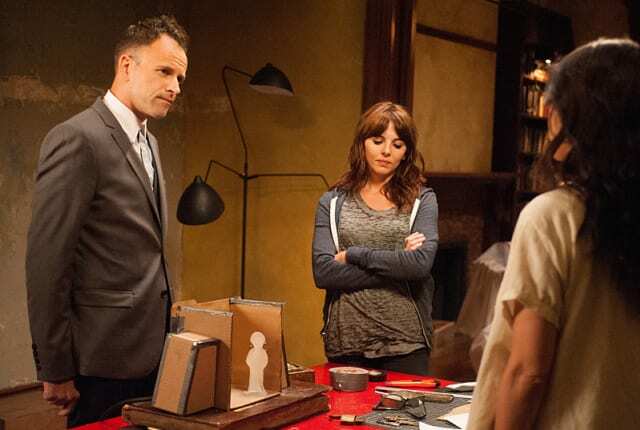 Watch Elementary Season 3 Episode 1 online via TV Fanatic and find out.